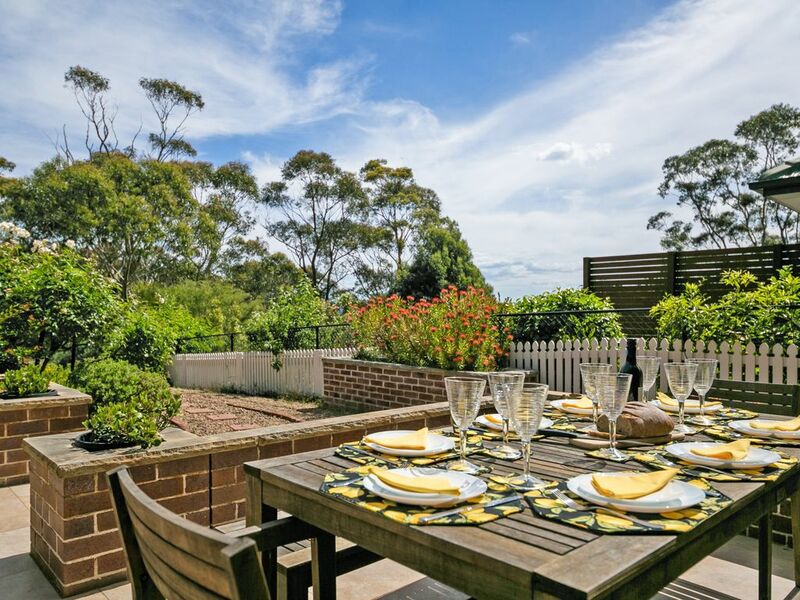 Coolabah is a large and spacious modern 4 bedroom home located in a picturesque area adjacent to the bush in Leura. The house is wheelchair friendly and is all on one level with polished wood floors throughout. A luxury gourmet kitchen features a dishwasher, microwave and everything you need for up to 8 persons. Three living areas allow everyone to spread out and enjoy the serenity of its quiet location while the patio gives views of the Three Sisters. 3 bedrooms have en suite bathrooms and there is a large family bathroom with a spa bath for your enjoyment. The property is both centrally heated and air-conditioned. The lounge feature a cosy open fire if you want but BYO firewood. This house is absolutely fantastic. The bedrooms with ensuites are very large. The multiple living spaces are wonderful. We didn't use the outdoor spaces because of the weather but can see they are comfortable too. The air conditioning worked beautifully. The Coolabah was the location for our annual family get together in 2019. The beautiful home was lovely, comfortable and spacious. Having 8 people in the home there was space to spread out and not to be in each others way. We feel a BBQ would have added favourable to the home. We would thoroughly recommend the Coolabah to any prospective users of the property. A beautiful large family home with a bit of country charm in a nice quiet street. We will be back. Fantastic house - so much space but still comfy! We (4 couples) spent a weekend at Coolabah. We had heaps of individual and combined space. We celebrated Christmas in July and even managed to cook a Christmas Dinner. Wonderful place to stay with friends and the open fire 🔥 was fantastic!